Make God's Word your everyday traveling companion. 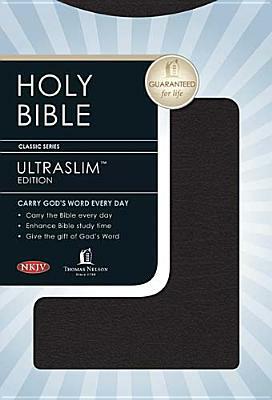 Thin and lightweight, Thomas Nelson's UltraSlim Bible boasts a complete and easy-to-read Bible that is ready to go when you are A Bible you can be comfortable taking with you every day and everywhere you go, the UltraSlim Bible is thin enough to tuck into your purse, briefcase, backpack, or glove compartment, yet large enough for easy readability. The UltraSlim Bibleis the perfect gift and ideal companion for today's Christian on the move. The New King James Version More than 60 million copies sold in 30 years.